The Most Rev. Robert C. Morlino, Bishop of Madison, died yesterday, Saturday, November 24th, at approximately 9:15 pm at St. Mary’s Hospital in Madison. He was 71 years old. Please pray for the repose of his soul, for his friends and coworkers, and for all of the faithful of the Diocese of Madison. Information regarding funeral arrangements will be forthcoming. Robert Morlino was born December 31, 1946, in Scranton, Pennsylvania. An only child, his father, Charles, died while he was in high school, his mother, Albertina, in 1980. He was raised in Lackawanna County, Pennsylvania, graduating from the Jesuit-run Scranton Preparatory High School. He entered seminary for the Maryland Province of the Society of Jesus, and was ordained to the priesthood for that Jesuit Province on June 1, 1974. His education includes a bachelor's degree in Philosophy from Fordham University, a master's degree in Philosophy from the University of Notre Dame, the Master of Divinity degree from the Weston School of Theology in Cambridge, Mass., and a doctorate in Moral Theology from the Gregorian University in Rome, with specialization in fundamental moral theology and bioethics. Father Morlino taught Philosophy at Loyola College in Baltimore, St. Joseph University in Philadelphia, Boston College, the University of Notre Dame and St. Mary's College, in Indiana. He also served as an instructor in continuing education for priests, religious and laity and as director of parish renewal programs. 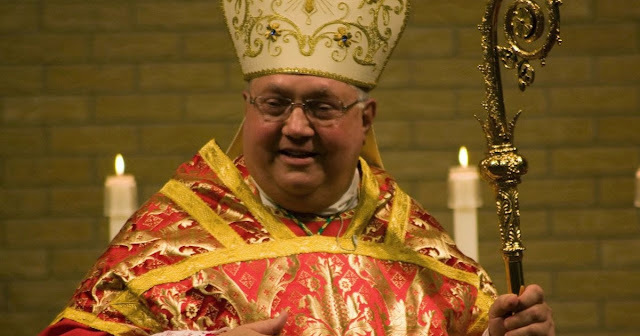 In 1981, Father Morlino became a priest of the Diocese of Kalamazoo and served there as Vicar for Spiritual Development, Executive Assistant and Theological Consultant to the Bishop, as Moderator of the Curia, and as the Promoter of Justice in the Diocesan Tribunal.